The Battle for the Dunkard Church During the Battle of Sharpsburg, September. Described as the Deathknell of the Confederacy - Sharpsburg (Antietam to the North) was a savage bloodletting for both sides. It was said to be the bloodiest day of the American Civil War. 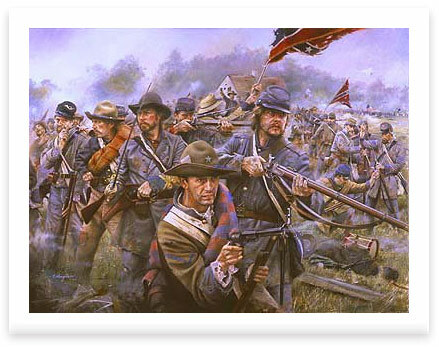 In the painting, below the Dunkard church confederate General John Bell Hoods Texas Division - or what was left of it- stand in line of battle. In the distance Union Major General John Sedgwicks division can be seen advancing on the rebel lines. During the ghastly four hour struggle the Confederates managed to hold and then repel the bloodied remnants of Sedgwicks division back to the east woods and at about 10.30am, the carnage around the Dunkard church had ended. Eventually though, the Confederate forces were in retreat, loosing Sharpsburg to the Union but prepared to fight on for two and a half more years, bloodied but unbeaten. Signed limited edition of 50 prints.